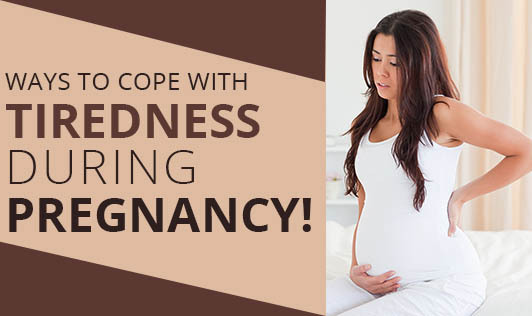 Ways to Cope With Tiredness During Pregnancy! Heed to your body's signals - Go to bed earlier than usual. Take a short nap when you can, even a 15-minute cat nap can help renew your energy levels and get up at roughly the same time every day. Be prepared to give up some control over the life-style - Cut out unnecessary social commitments, household work and other responsibilities from your routine. Take an occasional vacation in the middle of your pregnancy. Exercise daily - Moderate activity, such as a short walk or swimming can actually make you feel better and are considered safe exercises during pregnancy. Also, try to take frequent breaks throughout your day to stretch and breathe deeply. Check your nutrition - Eat little portions but often. A healthy diet made up of vegetables, fruits, whole grains, skim milk, and lean meats can be energizing. Try to fight the urge to consume junk food and empty calories. Stay hydrated - Cut back on caffeine and make sure you are drinking plenty of water, coconut water, fresh fruit juices etc. If frequent urination keeps you up at night, cut back on your fluid intake a few hours before bedtime and make up for it during the day. Reduce stress from your life - This can be a very significant contributor to tiredness. Learn relaxation techniques to reduce stress like Yoga, stretching exercises, meditation, massage (which is appropriate for pregnancy) and so on to get a better night's sleep. Say yes to People offering help - Accept help from others during this time. The less effort you have, the more rested you will feel. Get comfortable especially during the last few weeks of pregnancy as the exhaustion of carrying that extra weight can set in more fatigue. Get checked for anemia - Go with the physician's advice on medications if you need to take it during this time to prevent low hemoglobin levels.